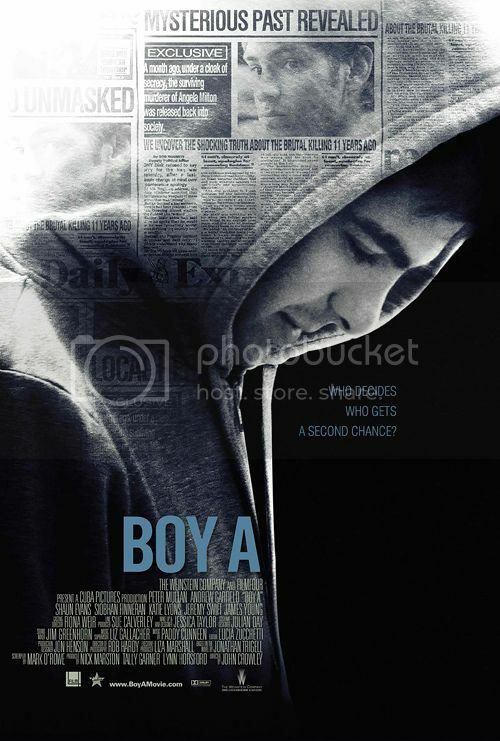 Boy A is an emotionally charged, gritty film about redemption and the inability to escape the past. It follows the life of Jack (Andrew Garfield), a young man recently released from prison for a murder he committed as an adolescent. Under the wing of his protective, gruff case worker, Terry (Peter Mullan), Jack takes on a new name, a new job, new friends and a new life. For a while, things seem to be going great: his assertive, gorgeous coworker, Kelly (Siobhan Finneran), courts him, his friends introduce him to the time-honored English tradition of going down the pub, and even, by a twist of fate, he manages to save a young girl from a car accident. Everyone is very forgiving of his mumbling shyness or his embarrassed insecurities, and everyone - the characters, the film, us - is quickly charmed by his shaky vulnerability. Of course, Jack is vulnerable. Despite Terry's proclamations that the "past is moot" and "we only look forward", Jack's past is constantly threatening to submerge his present. Wracked with flashbacks and nightmares, Jack is constantly dodging a limelight that feverishly searches for him. "EVIL COMES OF AGE," a local newspaper headline screams, touting a picture of Jack as a child on the cover. The film does a nice job of portraying Jack as innocent and damaged, building up - both in flashbacks and in the present - Jack's essentially gentle nature. We can't help but feel incredibly forgiving of whatever it is he did. Indeed, we were already inventing excuses for him. Then, just as things are turning sour for Jack's present, we flash back to the murder itself, and our slowly-fermented sympathies are given a good jostle. An unexpected and tenuously successful parallel is drawn between Jack and Terry's biological son, a mediocre loafer who hangs around the house watching TV and cradling beers. Filial jealousy and paternal bewilderment hinted at classical themes - King Lear-ish? - but it felt forced and inorganic. The best thing about this part of the film was its portrayal of a vigilante society using ex-convicts as scapegoats for its own failings. Andrew Garfield and Peter Mullan were perfect in their roles. Andrew Garfield's wispy boyishness struck us in the otherwise awful Never Let Me Go, while Peter Mullan likewise made an impression as the crusty, psychotic guard, Sid, from Children of Men ("Sid doesn't want to know. Sid doesn't care."). The filmmaking style was low-key and evocative, similar to Michael Winterbottom's Code 46 in tone and Dead Man's Shoes in the portrayal of a disaffected rural England where horrible violence bubbles under the surface. Recommended. I was wondering whether you have seen "The War Zone" directed by Tim Roth. It is a hard watch but suprisingly good cinema.